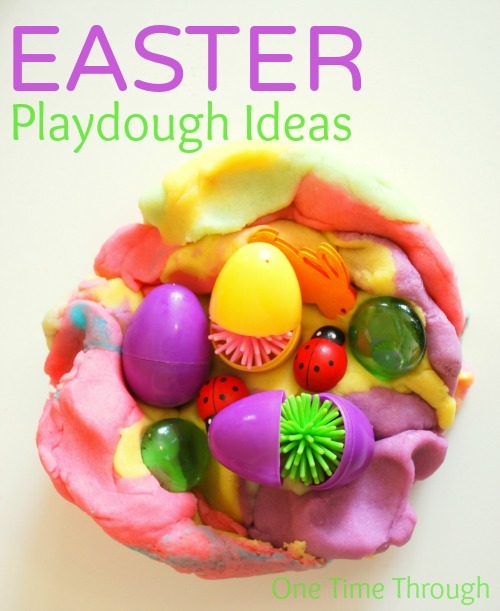 Running out of ideas for how to make play dough interesting for your little one? We all know the benefits for children of playing with play dough – builds fine-motor skills, allows for creative expression, and builds spatial and shape-sense. But… are your kiddos tired of playing with the same old tools? Mine was! So – I decided to try to mix it up a bit! 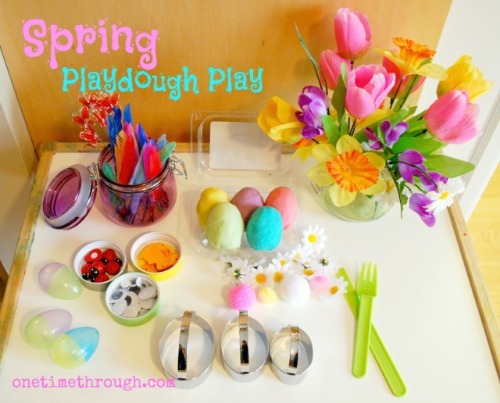 Try some of today’s ideas for a fun, Spring play dough make-over! Idea #1: Stick Things Into It! 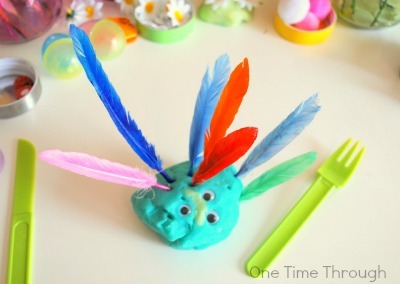 Provide some fun “spring-like” materials such as: feathers, butterfly floral picks, flowers, pompoms, ladybug woodsies, and of course – googly eyes! Onetime LOVES it when I hide things in his play dough. We tried: little plastic easter eggs filled with little surprises (marbles and wiggly things), Easter bunny wood-sies, glass beads, and ladybugs. One thing I have learned through teaching is that sometimes how well you catch the child’s attention at the beginning can predict how well they will engage in the activity. We made awesomely beautiful pastel coloured playdough using the ClubHouse Neon food colourings. Double my recipe below and separate it into 5 or 6 parts, then gradually knead in each colour until you get the beautiful pastel colours you want. Add glitter to your play dough at the same time that you add the food colouring! Add peppermint extract, almond extract, cinnamon, or jello powder to make your play dough smell divine! Mix dry ingredients. Add water and oil. Cook over medium/ low heat until dough looks dry, but is still sticky. Let it rest for 1 min, then knead in food colouring and sparkles and scents. 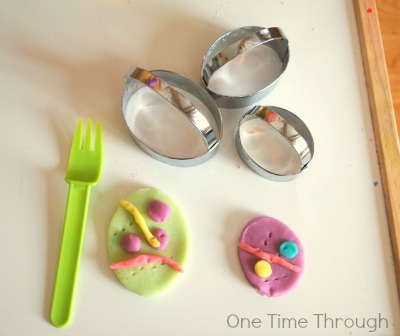 Get some egg-shaped cookie cutters and show your kiddo how to roll out, cut and decorate their own little playdough eggs. My cutters were circular until I pressed them in at the sides! 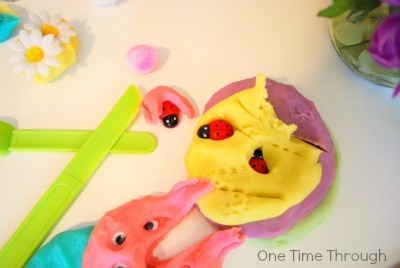 Try adding some oatmeal or rice to your play dough for that extra sensory experience! Sorry – no pictures! 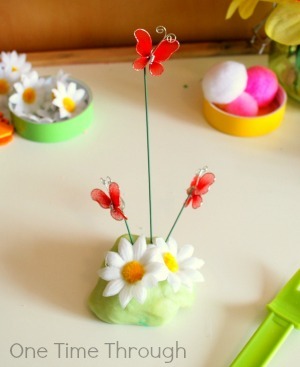 Makes the play dough look different too – which often re-engages kiddos! 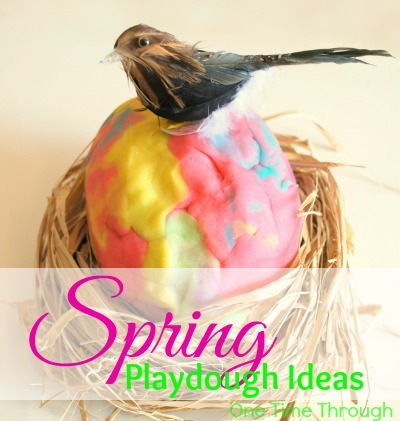 Hope at least one of these ideas inspires you and your little one for some fun, play dough play! 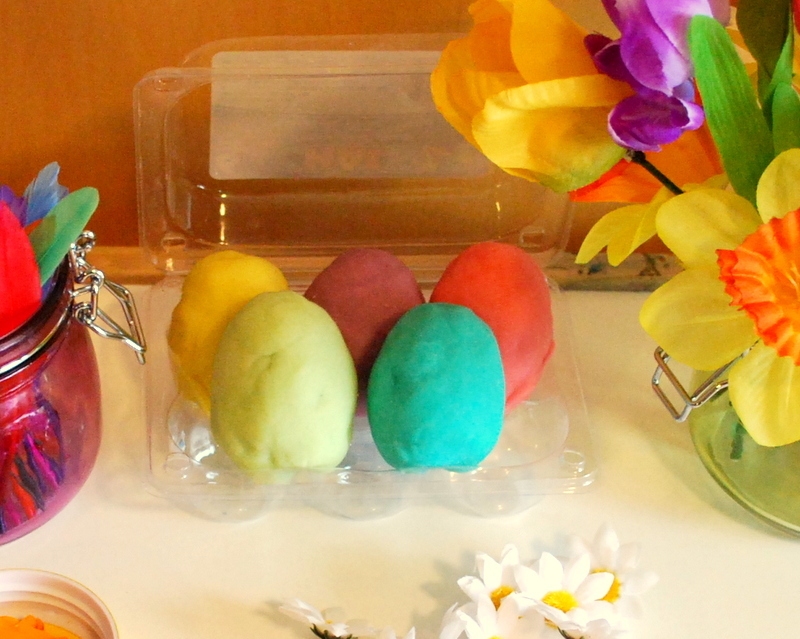 Do you have any ideas for Easter or Spring play dough play that I missed? Please drop me a line – I’d LOVE to hear it!